Private labelling is something that happens across many different industries. A private label product is something that has been manufactured by one company but then sold under another company's brand name. It happens all the time, especially in the food, cosmetic & electronic industries. It lowers production costs whilst maintaining good profit margins & these discounts are often passed on to us as the customer. Many items in Aldi & Lidl are private label products and these are fantastic for people with a small food budget. I buy some private label stuff from eBay & Amazon which allows me to save a lot of money on various products. However when it comes to cosmetics I think it's a tricky subject. I tend to gravitate towards cosmetics brands where the founders have a lot of creative input. I want to buy something new, unique & different to everything else out there. Otherwise, what's the point in buying it? If brands use private label manufacturers they have no control over the formula or the ingredients used in their products. The only thing that changes is the packaging & retail price of the product. Most of the time it's generally not a bad thing. It's only when brands are dishonest about private labelling in a way that negatively affects consumers that it becomes something to be worried about. There is a reason why I suddenly felt compelled to write about this subject. It's because I basically didn't really blog much last year & subsequently have a huge backlog of draft posts with fully edited photos to choose from. 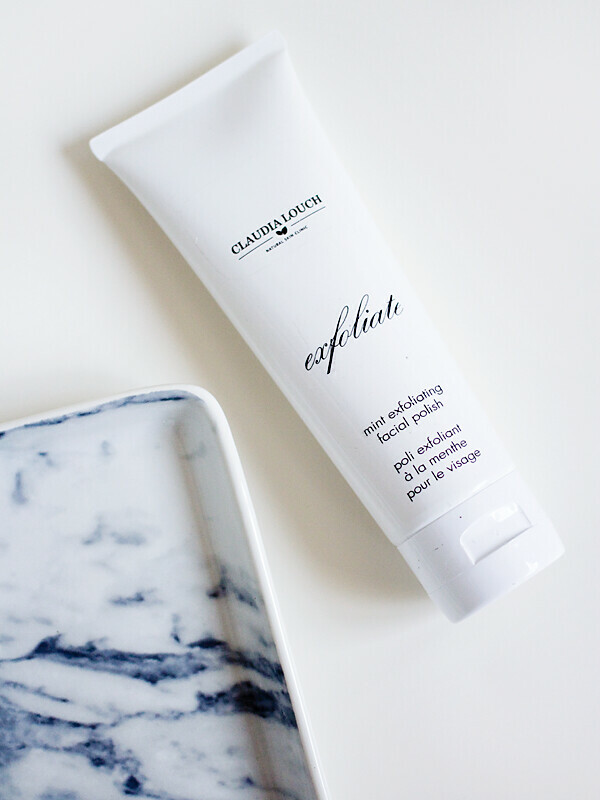 When I was deciding what to review next, I came across a post I had started about this Mint Facial Polish from Claudia Louch. I don't really like physical facial exfoliants so I used it as a body scrub instead but I didn't want to dedicate a few paragraphs to that boring conclusion. Before I received this item as my final PR sample from Claudia Louch I discovered something that has niggled me about the brand ever since. Whilst browsing Instagram one day I saw a skincare brand being promoted by influencers where the products had the exact same packaging as Claudia Louch. The names & ingredients were all exactly the same too. This brand was selling the products in America at a much lower price. I figured that they must have copied Claudia Louch as I had been told that she had personally helped to develop these products. When I asked the PR person I was working with about it they had no idea what was going on so I started to look into it myself. I googled the product names which resulted in lots of reviews from myself & many other UK bloggers. It also came up with loads of random skincare brands that I had never heard of before, most of them based in America & most of them selling the same products also at a lower price. I eventually found some sites where you could actually order them wholesale & get your own brand name etched on the front of the bottle. I came to conclusion that Claudia Louch's skincare range was entirely made up of privately labelled products. Normally I wouldn't take issue with this. It's an open secret that Morphe brushes are private labelled but I still buy them & love using them. They don't purport to be anything unique so when I buy from them I know exactly what I'm getting. But in this case I feel that the selling of these skincare products was both unethical & dishonest. It seems that Claudia Louch has since revamped her website with a different name & removed the shop section. When she did sell skincare products this Mint Exfoliating Facial Polish cost a whopping £59! A quick search for this product shows you can get it as cheap as £28 from another brand using the same manufacturer. I also found this brochure from the original manufacturer showing a production cost of $18.99 so the price has been marked up immensely. This was a PR sample so I'm not upset about the cost. However I do feel bad if anyone did purchase her products from my recommendation or the recommendation of many other bloggers who also received them as PR samples. Sure the products themselves were actually very good, I wouldn't have used them religiously if they sucked. But the whole story behind the brand & the creation of these products was a load of crap. In my reviews I defended the ridiculously high price tags because Claudia has years of experience as a skin specialist & we were told that she had a hand in developing the formulas. These blatant lies have left a bad taste in my mouth. If these were private label products she had no input whatsoever & insinuating that she helped to create them is not fair to us as informed consumers. Maybe this doesn't matter anymore as Claudia Louch no longer sells these products on her website but I still think it's an important subject to discuss. As consumers we deserve to know exactly what we're buying & when brands start lying to us in this way it's completely unethical. What are your thoughts on private labelling in the cosmetics industry?